CNN will air a special on Pope Benedict XVI titled, ‘What the Pope knew’, September 25th at 8 P.M.
"The decisions of translation are normally judgement calls between conflicting goods. Non-inclusive "man" appears in the new text, whereas the 1998 text had sought to improve the 1973 one by avoiding it. This is not because our translators are unreconstructed sexists, but because in some contexts the alternatives are judged by some to be unsatisfactory, both linguistically and theologically. The final judgement call, whichever way, should not be read as rejection of the differing concerns, but rather an option that one is more important. " Philip Endean SJ teaches theology at the University of Oxford. I think this new proposed translation of the Mass is flawed on a number of fronts, including use of non-inclusive language which provides more evidence of the Vatican's sexist attitude and failure to treat women as equals in the church. Where is women's equal dignity if all we hear in worship is "man" and masculine nouns and pronouns to address or refer to God? Women are equal images of God and our language in liturgy should be inclusive, including addressing the Holy One in feminine imagery. It appears the Vatican is heading full speed backwards to medieval times. What's next: Latin as the preferred language, the priests with their backs to the people, the return of altar rails? 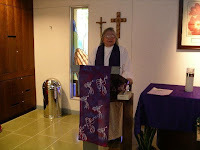 But the good news is that Roman Catholic Womenpriests use inclusive language and imagery for God in our liturgies. So, Catholics who do not like this new Vatican-imposed English translations can experience our liturgies where all are welcome and all are included. Let me make a prediction-- one day- the Vatican will adapt or perhaps even copy our inclusive liturgie . On this day Catholics worldwide will rejoice as people-empowered communities call forth qualified women and men to preside at the altar and conduct diverse liturgies that embrace the entire church---even using Latin from time to time! "Women Challenge Gender Apartheid in the Catholic Church"
"In a world radically changed by the women’s movement, the Catholic Church stands –- proudly—as one of the last bastions of patriarchy. Led by an unapologetic boys’ club, it has embraced a system of gender apartheid, deeply hostile to women’s agency, power and voice. Central to that system is the absolute ban on women’s ordination. An all-male priesthood deprives women of power by locking them out of the highest levels of leadership and decision-making, including and especially on matters affecting women’s most intimate lives, on maternity and sexuality. It also sends a vivid and visible message that women cannot, must not, are utterly unequipped to represent the Divine." "Because religion remains an extremely powerful force in the world, religiously countenanced discrimination against women has wide influence. It undergirds laws, policies and cultural practices that keep women in many places on earth silent and subservient, powerless over their reproductive health and lives, in abusive relationships, and in poverty. The Church refuses to endorse the use of condoms to prevent the spread of AIDS, endangering the many women who are powerless to dictate the terms of their sexual relations and at highest risk for the disease; refuses to support birth control, even though spacing births helps reduce the hundreds of thousands of maternal deaths each year, while also increasing the survival of babies; and condemns pregnancy termination even in the most dire circumstances, in Brazil excommunicating the mother and the doctor who ended the pregnancy of a nine-year-old raped by her stepfather." "... the new edict places the ordaining of women called by God to priesthood on the list of grave sins next to pedophilia, heresy, apostasy and schism. 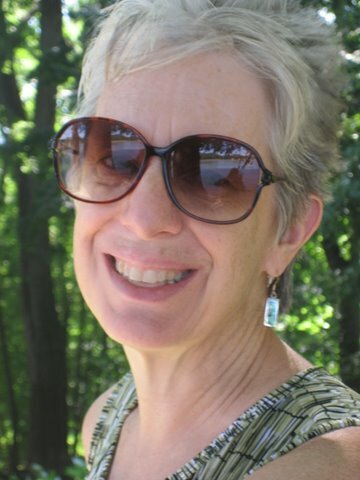 Catholics and interfaith communities across the world have reacted with shock and anger to the Vatican's latest demonstration of moral bankruptcy..."
"The Vatican's Pontifical Biblical Commission in 1976 concluded that there is nothing in the Bible to prohibit women's ordination. The emperor has no clothes. Catholics in the pews should stop giving until the Vatican starts listening. The church is the people of God, not the hierarchy alone. It is time for reform and renewal. " Janice Sevre-Duszynska of Lexington is a peace activist ordained a priest in 2008. "A woman was ordained as a Catholic priest in the Valley on Saturday in the kind of ceremony the Vatican recently condemned as one of the church's most serious crimes. 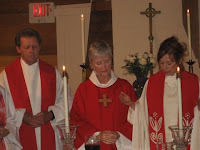 Elaine Groppenbacher received holy orders from Bishop Peter Hickman of the Ecumenical Catholic Communion, one of several liberal Catholic offshoots in the Valley. The ceremony took place at Guardian Angels Catholic Community, which meets in Tempe. " 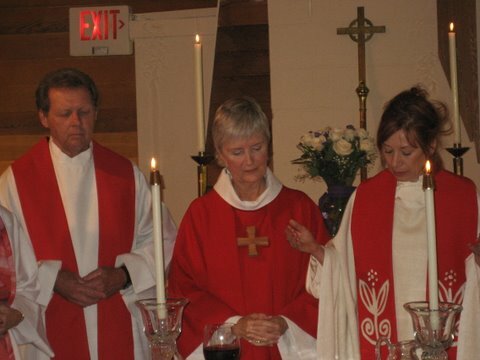 Groppenbacher is the fourth woman to be ordained as a Catholic priest in the Valley. Saint Andrew’s Church Hall, Short Street, Waterloo, London SE1 8LJ. Catholic Voices for Reform invite you to a press conference to consider questions that many Catholics would like to ask Pope Benedict during his visit to the UK. Catholic Voices for Reform is a new grouping of concerned Catholics who believe that it is essential that the Church undergoes a process of reform. CV4R brings together representatives of many of the Catholic Reform Groups in Britain and, through these groups, has ecumenical, European and worldwide connections. Although it is generally believed that Catholics seldom discuss and debate questions about their church, nothing could be further from the truth. Catholics throughout the country, at this time of preparation for the visit of Pope Benedict XXVI, are debating and questioning the future of their church. Questions relating to each of these issues will be addressed. Following the press conference we will deliver a letter, addressed to Pope Benedict, to Archbishop Nichols at Archbishops House Westminster, confident that he will ensure that the Holy Father is made aware of some of the issues concerning the future of their church being discussed by Catholics in England and Wales. All members of the press and broadcasting media are invited to attend. We will present many of the questions that Catholics are asking about the current situation and future of their Church. Full details will be presented and questioners will be available for comment and interview. A press pack will be available. "Bishop Dowling's blunt address was not only about what he called the "dismantling" of the Second Vatican Council, which reformed the church in the 1960s, but something else: the overwhelming "pressure to conform." Here's an irony: the one speaking out about speaking out apparently did not feel that he could speak out, at least not broadly, or at least not to everyone, or at least not publicly. His desire not to speak more publicly on the topic may have proved his point. " "None of this is meant to be a slight against Bishop Dowling, whom I've greatly admired for some time. He is a terrific leader, a wonderful teacher and, in many ways, a real prophet. What a bishop should and could be." "But neither is this surprising. Today in the Catholic Church almost any disagreement to almost any degree with almost any church leader on almost any topic is seen as dissent. And I'm not speaking about the essentials of the faith -- those elements contained in the Apostles Creed and the Nicene Creed -- but about less essential topics. Even on those topics -- for example, the proper strategy for bishops to deal with Catholic politicians at odds with church teaching, the new translations of the Mass, the best way for priests to address complicated moral issues, and so on -- the slightest whiff of disagreement is confused with disloyalty." How are we going to grow as a faith community without dissent? Roman Catholic Womenpriests are a gift to an instiutional church that is deeply sexist and fearful of women priests. Needed are courageous prophets, ordinary Catholics to speak truth to power, including to Pope Benedict. Jesus said, "fear not" and this is exactly what we must do. Speaking the truth boldly and in love to our institutional Roman Catholic leaders is not disloyal, it is is faithfulness to the Gospel. "The former head of Belgium's Catholic Church suggested to a sexual abuse victim it would be better to delay a public statement on the case until the bishop involved resigned in 2011, a Church spokesman said on Saturday." "Jurgen Mettepenningen confirmed transcripts in Belgium's De Standaard newspaper of a meeting Roman Catholic Cardinal Godfried Danneels held with Bishop Roger Vangheluwe and a sexual abuse victim of the bishop in April 2010." "It is true this meeting and conversation took place, and that the transcript is correct," Mettepenningen told Reuters.